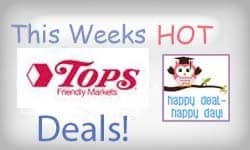 Tops Friendly Markets | Happy Deal - Happy Day! Here is a full list of Tops Friendly Markets Weekly Specials. Want some extra coupons for some of these deals? Check out CouponDede.com where you can buy them very reasonably! First Tuesday of every month – receive 6% off your total grocery and out of pocket pharmacy purchase, plus a FREE Mystery Item (pick up your free item coupon from the Customer Service Desk before you shop). Sign up at the Customer Service Desk – it’s FREE! Must show photo ID to qualify. Make sure that you have your TOPS e-Bonus Saver coupons and Click-to-Card coupons loaded to your Tops BonusPlus Card. Be sure to come back next week for an updated list of Tops Friendly Markets weekly specials!